I like her +1 if you've got a way to scry, or if you just don't care because you want those cards in your graveyard. Muldrotha would love the +1. 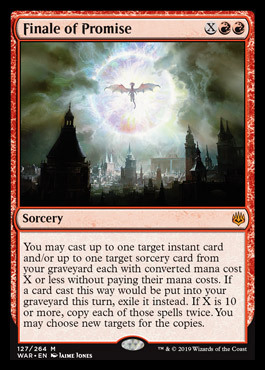 Finale of Promise is pretty cool - maybe it will replace Comet Storm as the Red Mythic X-spell that WotC inexplicably chooses to reprint into the ground. I'd be okay with that, if it means I never have to open another Comet Storm for the rest of my life. New non-green ramp staple, practically equal value to Explosive Vegetation in most cases, for less restrictive cost. I've been regularly impressed by the power of Torrent of Souls and Grave Upheaval in the decks that can use them well. Now hasty lasting reanimation (without an "exile/sac at end step" clause) is available outside of red as well. I don't expect this will make much of an impact in the format; most decks that highly value reanimation already make good use of the existing haste reanimators by looping the creature via Corpse Dance and sac outlets, or they run only the cheapest reanimators like Reanimate and the 2-mana and 3-mana enchantments, which all have access to opponents' graveyards as well. I don't see this replacing any of those, but in general I do think haste is even more important on your big threat creatures in a multiplayer free-for-all game than in a duel. Also I find the phrasing of haste's duration on this interesting - "until your next turn" means that unlike "until end of turn" haste, you can use this on Avatar of Woe or something similar and leave its tap ability open until the end step just before you untap. 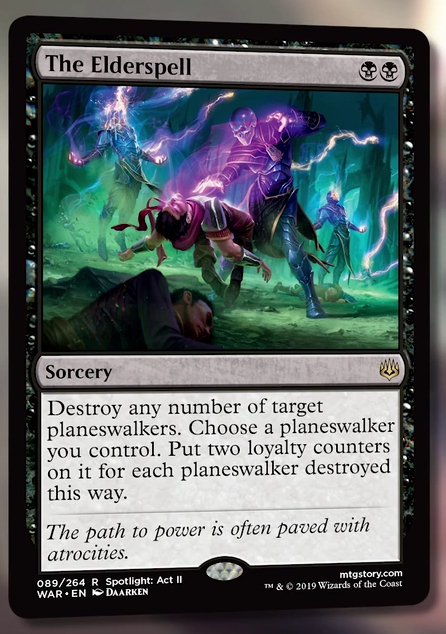 Of course the downside of this is that if your opponent lands Take Possession on their turn, it still has haste for them. But that's an extremely narrow downside compared to relatively more common upside. Interesting sidenote on reanimation spells. That's quite a cost for this effect. It's way better than the usual (b)(b): Destroy target nonblack, nonartifact, monocolored legendary creature, you lose hp equal to its casting cost... sort of black's-hardly-the-best-at-killing removal it usually gets. I'm surprised this isn't a single white mana. WotC believes that white are the most efficient killers in the multiverse. Black makes a show of looking evil. White actually gets the job done. That hasn't been true for several years. Murder is the new standard "kill something no questions asked" card. White doesn't get anything like Path to Exile any more. Really good with Soulfire Grand Master if you're in those 4 colors. Oh, right, Purity turns it into actual lifegain.